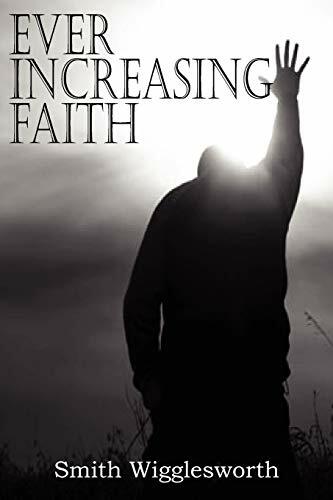 Consistent, unwavering FAITH is the goal for every Christian and Smith Wigglesworth's Ever Increasing Faith will help the reader more fully understand how to accomplish this in their own life. A simple concept yet difficult to consistently apply to life your faith in God will lead you to great triumphs. "These are days when we need to have our faith strengthened, when we need to know God. God has designed that the just shall live by faith. Any man can be changed by faith, no matter how he may be fettered. I know that God's word is sufficient. One word from Him can change a nation. His word is from everlasting to everlasting. It is through the entrance of this everlasting Word, this incorruptible seed, that we are born again, and come into this wonderful salvation..." Smith Wigglesworth was a British evangelist instrumental in the early history of Pentecostalism. Wigglesworth believed that healing came through faith and practiced anointing with oil. Wigglesworth said he had made a commitment to God that he would not sleep at night before he had won a soul for Christ every day. He claimed that on one occasion he could not sleep because he had not met this commitment, and that he went out into the night and met an alcoholic to whom he spoke and persuaded to become a believer. For author Smith Wigglesworth, life was a continual adventure. Always trusting God, even in the most hopeless situations, he had total confidence in the power of Christ. Join this late evangelist in the great adventure called "faith," where miracles were daily events. Witness the many accounts of deliverance from diabetes, tuberculosis, demon possession, and even death. Prepare to be overwhelmed as the seed of faith begins to expand and grow in your heart. Watch as God moves, touching lives with healing and deliverance––miracles that follow as signs of the power of faith. Your faith, great or small, can multiply ever increasingly as it overflows into the lives around you, bringing glory to God and blessings to the world! Smith Wigglesworth (1859Â–1947) was born in England in 1859. Immediately after his conversion as a boy, he had a concern for the salvation of others and won people to Christ, including his mother. He became a plumber by trade, yet he continued to devote himself to winning many people to Christ on an individual basis. In 1882, he married Polly Featherstone, a vivacious young woman who loved God and had a gift of preaching and evangelism. It was she who taught him to read and who became his closest confidant and strongest supporter. They both had compassion for the poor and needy in their community, and they opened a mission, at which Polly preached. Significantly, people were miraculously healed when Wigglesworth prayed for them. In 1907, Wigglesworth's circumstances changed dramatically when, at the age of forty eight, he was baptized in the Holy Spirit. Suddenly, he had a new power that enabled him to preach, and even his wife was amazed at the transformation. This was the beginning of what became a worldwide evangelistic and healing ministry that reached thousands. He eventually ministered in the United States, Australia, South Africa, and all over Europe. His ministry extended to the time of his death in 1947.